Ben Bernanke testified before the Senate Banking Committee this morning to discuss monetary policy and his outlook for the economy.But things got heated when Tennessee Senator Bob Corker when on the attack, calling him an uber-dove who was putting the Fed’s balance sheet at risk. Bernanke, however, swiftly rebuked, and went on to defend his track record. Sen. Corker: I don’t think there’s any question that you would be the biggest dove, if you will, since World War II. I think that’s something you’re rather proud of…Do you all ever talk about the longer term degrading effect of these policies as we try to live for today? If we tried to raise interest rates to three, four or five per cent while the economy is still weak, it could not be sustained. Our economy is not strong enough to sustain real high real returns to savers. If we tried to do that we would throw our economy back into recession and we would have low interest rates like the Japanese do. CORKER: Yeah. Do you concern yourself with the whole notion of being perceived? You know, we watch regulatory capture take place where basically the regulators end up working for the people that they regulate. We had TARP, which most people felt like that was a needed thing during a crisis. And then we had an easy money policy which really allowed the big institutions especially on Wall Street to reap tremendous benefits in the early stages without doing anything. And then you’re getting ready, I guess, in a few years as you alluded to when interest rates rise to basically have to print money to sell securities at losses, and then pay to sell secures at losses and the pay interest on reserves which people have pointed out and I think you all talk about is going to be billions and billion of dollars going to these institutions that again you regulate. Do you concern yourself at all with the Fed being viewed as not as independent as it used to be? CORKER: Oh yes they are. BERNANKE: Well. So to take the case of paying interest on reserves in the exit, No.1, that is beneficial for the taxpayer because, on the lefthand side of the balance sheet is reserves, but on the right hand side is the securities that we hold, which pay a higher interest rate than the reserves. So by doing that we actually make a profit, which we remit to the treasury. We’re not helping the banks. 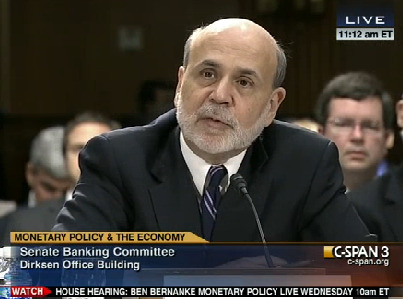 BERNANKE: We’re going to be paying market rates. we’re going to be paying exactly what you’re getting on the repo market, the commercial paper market, anywhere else. There’s no subsidy involved.